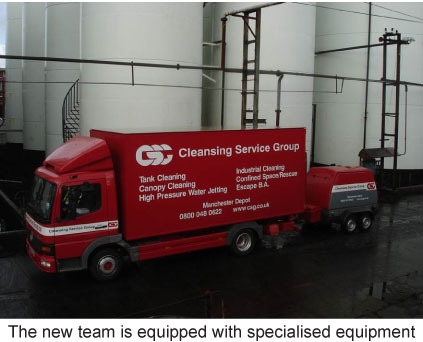 A rapid increase in demand has prompted industrial waste management company Cleansing Service Group (CSG) to expand its specialist tank cleaning operation. The company, which has its national headquarters in Fareham, Hampshire, has announced a £40,000 investment programme designed to keep pace with new tank maintenance orders and increase its geographical coverage. CSG’s tank cleaning contracts have always been carried out from the company’s Plymouth depot. But now a second unit is being established at Cadishead near Manchester where CSG operates the UK’s largest industrial waste treatment and recovery facility. “We’ve seen a surge in new customers based in the north of England and we’ve put in place all the facilities we need to handle it,” said CSG Tank Cleaning Division manager Darren Negus. An additional two-man team, backed by investment in specialist jetting equipment, has been recruited and will carry out high pressure tank cleaning, installation and decommissioning services across a wide variety of industrial sectors ranging from airports to food manufacturers and the petrochemical industry. New technology jetting equipment will be deployed for cutting, descaling, coating removal and surface preparation operations in any kind of tank undergoing maintenance. The team, which provides an emergency response service, has been also been equipped and trained for accessing confined spaces such as storage vessels contaminated by hazardous substances, as well as for carrying out more traditional no-entry cleaning.